The following article is written by Dr Caroline Farey and John Casey and of the Maryvale Institute and first appeared in The Sower, which is published by the Maryvale institute and distributed in both the UK and the UK. It is available online at www.thesowerreview.com. This is written about paintings of the Annunciation, but through it they describe very clearly the principles by which one can choose a painting for catachetical purposes. This is something that is very important, but additional to its appropriateness for a liturgical setting or for devotional prayer. Caroline and myself will be teaching the summer residential weekends for the diploma offered by the Maryvale Institute, Art Beauty and Inspiration from a Catholic Perspective. 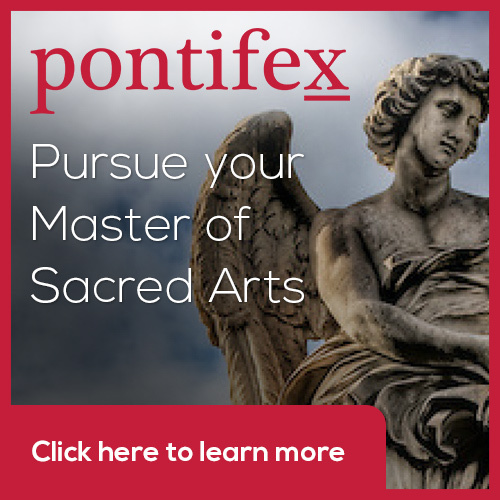 The goal of this course is to understanding of the place of beauty in Catholic culture with a special focus on visual art; by this we hope to contribute to the formation of future artists and patrons who serve the church. The course is offered in the US through the Maryvale Mid-America Center at the Archdiocese of Kansas City, Kansas . It is design with for working adults (and that means stay-at-home mums as well) living in any location, provided they can get to the first residential weekend. The dates of the first residential weekend are July 12-15 (Friday-Monday). Even if you don't wish to do the written work for the diploma, you would learn a lot if you chose to audit the course - attending the residential weekend and then working through the accompanying material at home at your leisure. 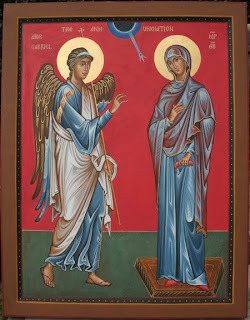 A picture of the annunciation is a resource par excellence for catechesis because it can illustrate so many interconnecting doctrines of the faith. Having said this, not all artists have the same degree of ecclesial depth and so some pictures will be of greater catechetical value than others. At this point it is also good to be aware that one might look at a painting of a great artist,r a very beautiful painting, or one that speaks very personally, or one helpful for prayer or meditation – none of these criteria, however, makes the painting necessarily the most appropriate to use catechetically. What, then, do we need to look for as catechists in order to choose the best art of the annunciation for our purposes? Where there is nothing at all to indicate the Trinity, the value of the painting for catechesis is greatly reduced because, as we know, the Trinity is the ‘light that enlightens’ every dogma, every mystery of the faith (CCC 234). Most annunciation scenes, however, will depict the presence of the three Persons of the Blessed Trinity in some way. The icon by Aidan Hart reproduced here gives us an explicit indication. Many older scenes show God the Father and the dove of the Holy Spirit very explicitly, with these and the lamp; angel Gabriel all oriented or pointing towards Our Lady to indicate the presence of the divine Son. Other versions work more subtly but equally effectively. Nicolas Poussin, uses light sources, one from off the painting indicating God the Father, the light shining around the Holy Spirit and the light of the angel as the messenger of the Word. Fra Angelico uses triple rounded arches to embrace the whole scene as though holding it in the stillness of eternity, so great is this moment. Scenes that show nothing of heaven would tend to be less useful catechetically. Heaven unites with the earth at this moment and the way this is portrayed can provide important catechetical opportunities. Many icons will have a gold background indicating the heavenly nature of the event. Others have the sky bursting open surrounded by angels. Sometimes the angel Gabriel is part of the heavenly aspect, since Gabriel is a messenger from heaven, while in other pictures the heavenly scene surrounds the Holy Spirit portrayed as a dove. Catechetically, it is important to be clear with people that angels are creatures, they are not divine; but they do ‘come and go’ Christ tells us, to and from the Father’s presence, from beholding the face of the Father (see Matt 18:10-11). They can indicate the vibrancy of life in heaven. The figure of Mary is portrayed in various ways. In the middle ages five ‘stages’ of the story in the Gospel of Luke, or ‘conditions’ of Our Lady, were outlined with changing hand gestures for each stage: conturbatio (surprise at the arrival of the angel Gabriel: Mary ‘was deeply disturbed’;cogitatio (Mary ‘wondered what this greeting could mean’; interrogatio (‘How can this be?’); humiliatio (humble acceptance and faithful submission to God’s will); meritatio (internal bliss, joy at the miraculous conception of Jesus, the Son of God). The first two conditions lasted only a moment in Mary’s life and are probably the least helpful catechetically. That Mary dialogued with the angel (interrogatio) is of value, and this is normally portrayed as one hand raised and the other resting on an open book, as catechesis needs the same kind of questions of meaning and questions of embodiment that Mary raised - such as, how can this truth of the faith be lived out in my life? Best of all, however, are the two final moments. Mary’s humility and humble acceptance (humiliatio) is typically portrayed as hands crossed on her chest. The final moment of the joy of union with the Holy Spirit as the incarnation of the Son of God takes place (meritatio), is often painted with arms extended and hands completely open. Poussin’s annunciation is a perfect example of this with Mary’s yellow cloak indicating the golden acceptance of grace flowing down from her mind and pouring onto the wood of the platform, like the step of an altar, on which she sits. These scenes would be a constant reminder in a catechetical session of the joy that comes from acceptance of the grace of God and the teaching of the Church. Mary should portray, too, the exquisite dignity of the human person when humble and obedient, when listening and open, when joyful and freely accepting, longing for and fulfilling, the will of God. How the angel is portrayed can indicate more about Our Lady. It was a custom amongst some artists to ensure that the angel was portrayed lower than Mary as an indication that she, as mother of God, would be their superior, their queen. Amongst other artists, since Gabriel was ‘from God’, he was portrayed floating or flying down from a heavenly realm. As long as the majestic angelic nature is in evidence, the position can be informative wherever placed. The angel Gabriel, as the messenger of the Word of God, embodies certain signs of the message. Pointing upwards and pointing to Our Lady’s womb are typical gestures. 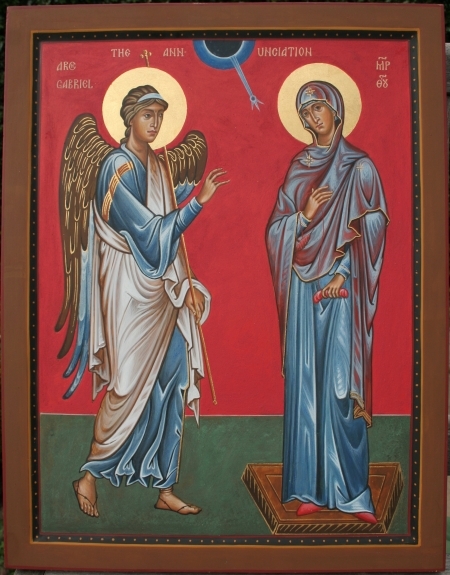 Sometimes, as in the icon here, the wings tell the same story, with one pointing to God from where the Word has come,and one pointing to earth, an indication of the Word to be made flesh. The lilies carried by Gabriel in some pictures remind us of Mary’s purity because she was conceived without sin. This dogma of the Immaculate Conception depends partly on this Scripture passage and particularly on Gabriel’s greeting, not calling her by her expected name, ‘Mary’, but using a special Greek word approximately translated ‘full of grace’ but carrying so much more meaning. Buildings indicate the temple and the Church, the old order and the new with Mary often on the threshold. Mary is the model of the Church, the ‘house of God’. It is good if there is a building in the picture for these reasons. Sometimes the building is actually a portrayal of church architecture, sometimes it is more figurative. Sometimes it is in the architecture that stonework or woodwork is seen in the form of a cross. Where the building structure is very ornate, it might be an exaggerated form with excessive structural focus,such as in the painting by Crivelli. Curtains are important for many of the same reasons but the artist doesn’t always portray these with the significance that they deserve. The original tabernacle, following the designs given directly by God in the desert, was a tent with curtains embroidered with ‘blue and purple and scarlet stuff and fine twined linen’, a refrain repeated throughout the book of Exodus (see Ex 36:8ff). Frequently, the background of the scene is not a building but a bedroom. The curtains are not only the tabernacle curtains, those of the ‘tent of meeting’ or the temple curtains – often in two parts to remind us that it will be ‘torn in two’ at the crucifixion (Matt 27:51) – the sword that will pierce Mary’s heart (Lk 2:35). The veil, drawn back indicates the fullness of revelation, the fullness of God to be conceived in Mary. A curtain is also reminiscent of the curtains around a medieval altar. If the painting is from Northern Europe or England, the curtain drawn up as a hanging bag directly over the space between Gabriel and Our Lady – the space into which the word is spoken – bears a strong resemblance to the hanging tabernacle in medieval churches before the Council of Trent prescribed a lockable container. 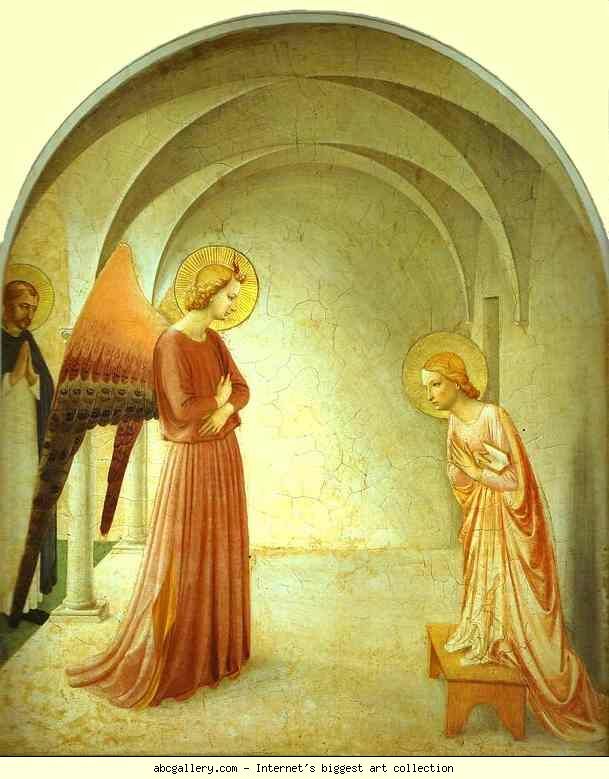 At this point the annunciation scene is carried forward to the Eucharist and the paschal mystery. Finally, it is helpful to examine the garden or landscape in the picture for our catechesis. The Song of Songs is the source of the early idea of the enclosed garden symbolising Mary’s virginity (4:12). Landscapes turn our thoughts to land, and in biblical terms this is the promised land flowing with milk and honey, indicating our eternal homeland of God’s life of joyful love, the destiny for which the Father prepares us through the redemptive grace and adoption that comes from the work of the Holy Spirit and the Son of God made man. Open to all. No qualification needed. Distance learning with residential weekends in the US or the UK The course is intended both for working artists and those interested in art (with the thought that you might become the future knowledgeable patrons of the art). The Maryvale Institute which offers this course has a mission is to deliver degree-level education to working, mature students. As such it is designed so that no previous qualification is required in order to attend this course. The teaching method works from first principles and so anyone with the innate ability, almost regardless of previous levels of education, will flourish. This has been so successful that their methods have attracted attention in Rome and and a result the Maryvale Institute has been made the only Higher Institute of Religious Sciences - graduate and post-graduate level educational institution - with pontifical status in the English speaking world. 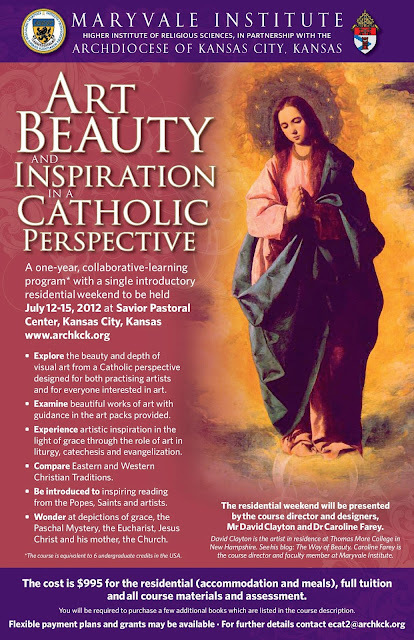 It is good news that its courses are now offered in the US via the Diocese of Kansas City, Kansas. This is not your standard online course - the Maryvale Institute has developed its own method of teaching at a distance through use of expertly designed coursebooks and attendance periodically at residential weekends. Termed 'collaborative learning' that is so effective that they view it as superior to the education received at conventional full time courses. The recent awarding of pontifical status is recognition of not only of its faithfulness to the Magisterium of the Church, but also the standard of excellence in the teaching offered. The dates of the first residential weekend are July 12-15 (Friday-Monday). The link for courses are here. Contact Kimberly Rode from the archdiocese for information about both. The year course costs only $1095 including course materials, tuition, accomodation and meals for the residential weekends and assessment. You will be required to buy a few books in addition to this.